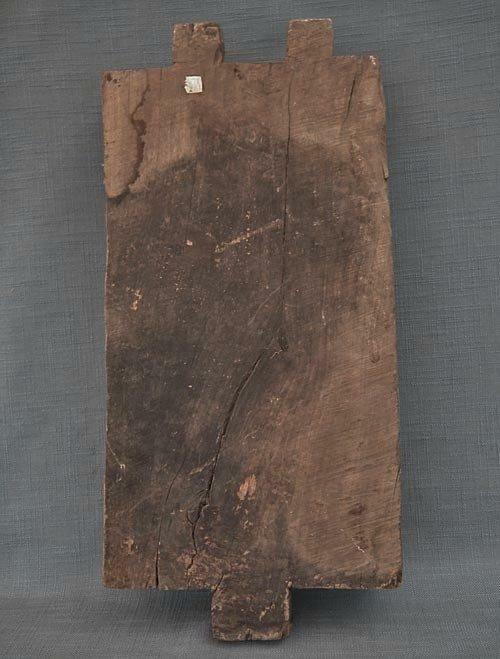 Authentic antique, 18th century or earlier, south Indian wood panel, which would have formed part of the decoration on the Ritual Temple Chariot. 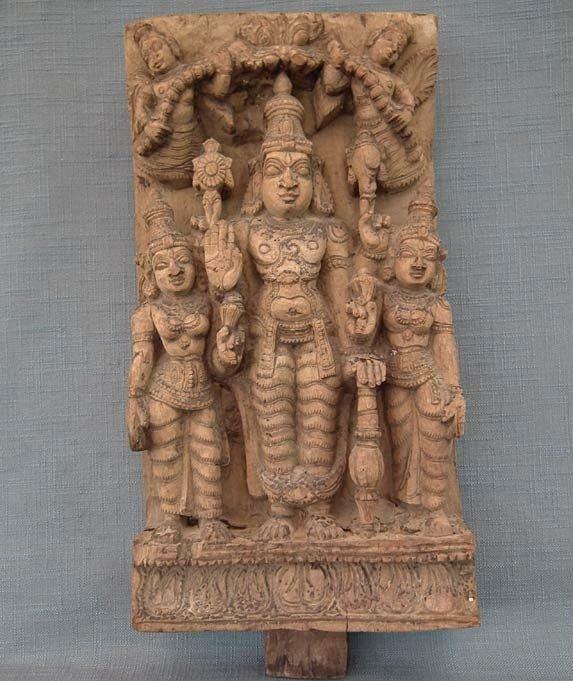 The wooden panel is hard and is extremely well carved in deep relief depicting a triad of Vishnu, Shridevi, and Bhudevi. The four-armed Vishnu standing upright holding his attributes of a flaming discus and a conch held in his two back hands. His principal hands showing the lotus and the stance of holding a mace and wearing a dhoti, necklace, and pendent sashes. His face flanked by elongated earlobes, and surmounted by a high conical headdress, surmounted by kirtimukha adorned to each side by a flying winged figure. Flanked by his two consorts, Sridevi and Bhudevi, each holding a lotus bud and with their outer arms elegantly extended alongside their bodies in mirrored poses, dressed in a long dhoti tied at waist with a sash torso adorned with necklaces, and her arms with armlets and bracelets. 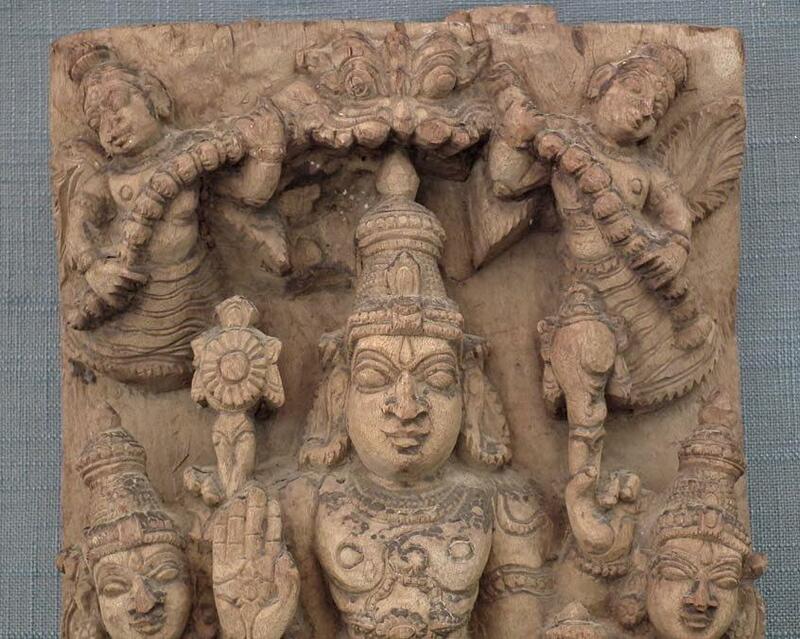 To see related 18th century Hindu wood panels, please see the links below. CONDITION: In its original condition, as had been found. Showing age and is free of oiling, waxing, repairs, and restorations. The wood has no softness or any sign of infestation, but has wear on the exposed areas. The surface has a rich original patina overall. The surface has very dry black spots 1mm-2mm thick, which are flaking and are possibly remains of the old paint or other protective substance that has once covered it. 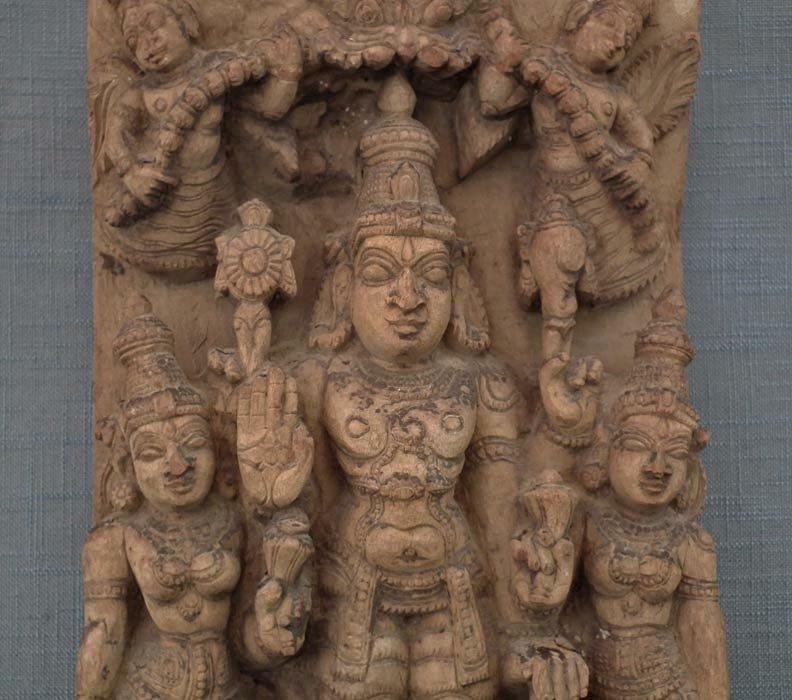 The figure on the right side of the Vishnu and the two flying winged figures have minor chips in their noses which can be aspect from a wooden sculpture that is over a 200 years old. Since the market is flooded with considerable numbers of Replicas and forgeries of Indian antique art objects including chariot wood panels carved from old wood with surface finished to look old, these objects for inexperienced collectors look the same as authentic artifacts. However, these reproductions do not have any historical, or investment value. 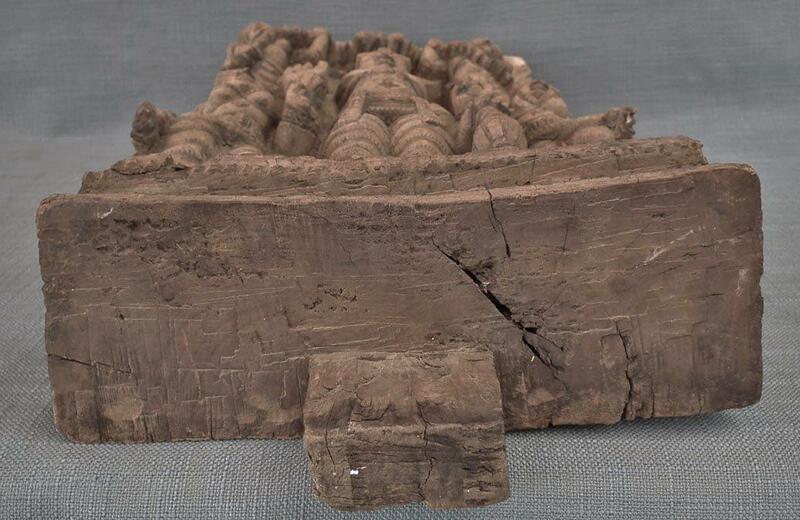 We would like to inform our clients that this is a 100% authentic Antique, 18th century or earlier, Indian wood Chariot Panel, and is accompanied by a Certificate of Authenticity. 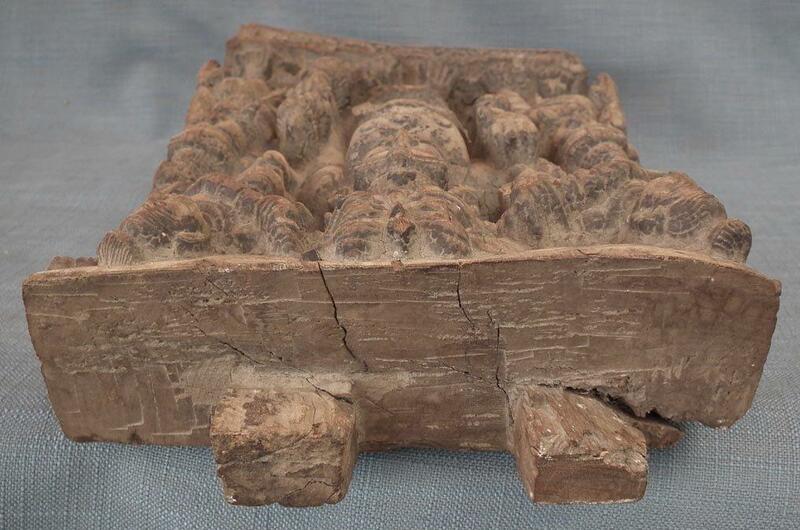 PROVENANCE: The panel was acquired in local Ottawa Canada antique estate sale along with other Indian antiques. During the late 19th and first half of the 20th century many British served as the government or army officers in India. After Indian independence in 1947, many of them migrated from India to Canada and bringing personal belongings including antiques.